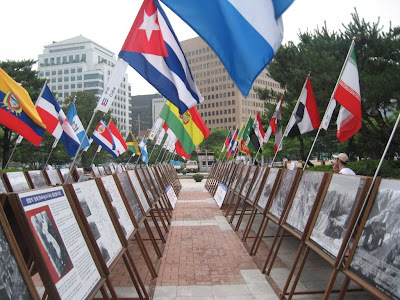 For a few years now I've been working as a writer for the still be developed but hopefully soon completed website Guampedia, which promises to be an sen maolek na resource for those in Guam and elsewhere who are searching for information on all sorts of aspects of Chamorro history, language and culture. 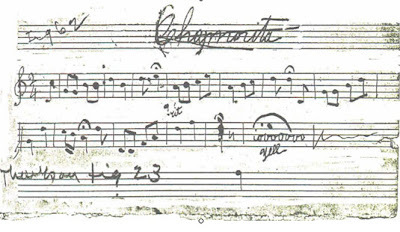 Over the summer I finished an entry on "Religion During I Tiempon Chapones" which I am very proud of, and the year before that I completed several entries about the lifestyles of the Chamorros from several hundred years ago. I am by no means the only writer on the project, several dozen people are working on different parts of who we are as a people, where we have come from, and those who have (for better or worse) come to Guam to take or share our island. At present if you click on the link above, you'll see a skeletal outline of the project, and some demo entries of what the encyclopedia will look like. You can also find a number of easily accessible and sometimes rare images of life on Guam over the past century. Since I'm not feeling well today, and don't have many coherent thoughts to put out on my blog, just thought in order to introduce you to the website itself, I'd paste one the entries I worked on, for you to check out. Ancient Chamorros were avid and skilled hunters both on land and sea. 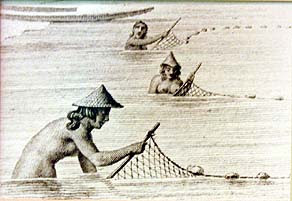 As i tasi (the ocean) was their primary source of sustenance, Chamorros developed dozens of methods of eguihan (fishing). The basic methods of catching fish were etupak (line fishing), laggua (net fishing), fisga or pulus (spearfishing) and lalago (fishing by hand). These were enhanced by different techniques or devices meant to trick or lure fish. One such device, made from coconut shells and stone was a poiu. 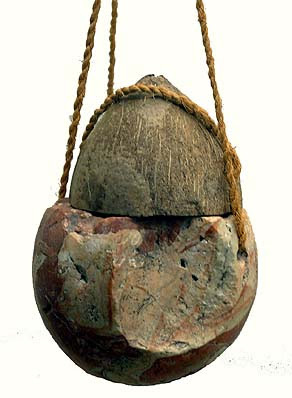 An e’eguihan (fisherman) would lower a poiu filled with ground coconut into the water. Holes were drilled in the shell and stone, so as the poiu was raised and lowered, small bits of coconut would escape, attracting huge schools of fish. For weeks they would return to the same spot, each day lowering the poiu a little less. 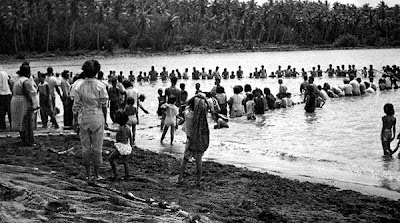 On the last day, a laggua achuman (large net) would be set beneath the spot, to catch the feeding fish, who were by now close to the surface. Ancient Chamorros used fish themselves as lures. Catching them, feeding them, attaching a line to them and thus treating them as pets. Once the fish was trained and tamed it would be used to lure other fish in the Chamorro’s nets. Ancient Chamorros also constructed structures in order to trick fish. They built fake shelters for fish to hide in at night, and then surrounded them with a net and speared them. They also built gigao made from wood or stone, which would channel fish into certain spots where they could not escape. For centuries, visitors to Guam marveled at the skills of Chamorro maneguihan (fishermen). The fact that they were one of the few Pacific peoples who successful caught deepwater fish attests to this. According to one account, a Chamorro caught a marlin with a hook and line, and so as not to break the line, began to tire it out. A shark soon appeared and attacked the marlin. The Chamorro capsized his boat, tied his line to it and then swam out to the marlin and diverted the shark away from his prey. After the shark was gone, the Chamorro returned to his craft with the marlin and sailed home. The labors of i tasi was divided by gender and class. Women were responsible for fishing within the reef, while men, beyond it. Furthermore, the lowest class, manachang, were prohibited from fishing. On land, Chamorros hunted the fanihi and ayuyu. E’efanihi (fruit bat hunters) used a laggua attached to a long wooden pole to snare the creatures as they flew by searching for fruit. E’eayuyu (coconut crab hunters) used ponne’ or stale coconut meat to lure out the crabs and then sneak from behind and catch them. Since the Spanish introduction of binadu (deer) and babui (pigs), Chamorros have become skilled hunters of them as well. In 1919, Chamorros became e’echa’ka (rat hunters) after Governor William Gilmer decreed that all Chamorro males must deliver five dead rats each month or pay a fine. I am so glad you posted this. I am trying to think of a title for our documentary- the one from my community development course last semester.The beginning of the title is Casting Our Net. . . trying to complete the last half of it. I love that photo of the in-reef fishing party. It is exactly what i am trying to convey with our title and the whole essence of the film.What is its title? Where can I get a copy of that? Please email me when you can.